Can those of you with gooseneck trailers who do a fair amount of hauling comment on the GVW rating on your trailer as compared with the useful load capacities of the trailer itself? I'm looking to buy a gooseneck trailer at the moment to haul the JD450 dozer, JD410c backhoe, and Kioti DK45C tractors that I have and have recently purchased. (Don't intend to haul them all at once.) I think the dozer is probably going to be the heaviest at 14,400 lbs. I've got a Forf F350 Crew Cab 4x4 dually with a GVWR of about 10K I guess. That means any trailer I add to it needs to have a rating of less than 15,999 lbs to keep me under the 26K that would require me to get a CDL. Lots of goosenecks for sale with twin axles that are 7K each. But in my mind I'm thinking that if they're rated for a total of 14K then I need to subtract at least a portion of the weight of the trailer (since the truck will carry some of the weight) and that would give me the remaining useful load. Am I thinking right? Is a trailer with a GVW rating of 14K too lite to haul that dozer at 14,400lbs? I think that 410 backhoe is about 16,000 lbs, isn't it? They make the gooseneck trailers with heavier axles, that will haul this equipment, but then you would need a bigger truck than a 1 ton to be legal towing it. The 7,000 lb axles are going to be a little light, like you thought, most of these trailers are 3,000-3,500 lbs unladen wt. Part of the answer depends on how your state enforces the DOT rules. For the most part, the GVWR is not the most important thing enforcement wise as the max trailer capacity on these pickups would not allow you to pull much of a trailer. The first thing most DOT enforcement people look at is tire ratings and then second is max license weight. Say for example your pickup weighs 8000 lbs, the 16,000 lb trailer weighs 4000 lbs, and you have a 16,000 lb backhoe. You could be theoretically legal if you could transfer 4000 lbs of the backhoe to the pickup and then your pickup would weigh 12,000 lbs and the trailer 16,000 lbs. But assuming you have four tires on the trailer, each tire will be carying 4000 lbs and that is too much. About the maximum weight you can expect to carry on four 235-85R16 tires is 12,000 lbs. You can actually get that up to 15,000 lbs on four G rated tires, but that is the max. So what you get with a trailer rated at 14-16,000 lbs is actual weight capacity on the trailer of 12,000 lbs. So look at the tire ratings on the sidewalls first. That will tell you what the max weight your trailer can scale. Anything over that must be transfered to the pickup to be legal. I don't believe you can get by with a 14 or 16,000 lb trailer and I personally think those trailers are too light for what you want to haul. I don't think you have any choice but to go with a 20-24,000 lb rated trailer with dual tandem axles. 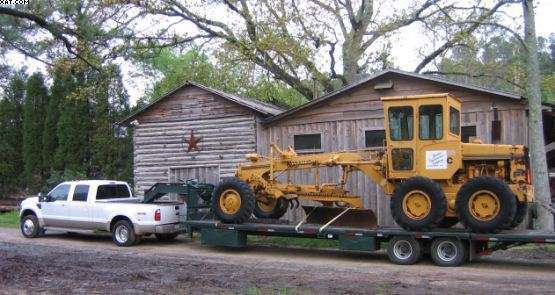 Plus dozers are hard on trailers. I doubt any 14,000 lb trailer, at least the ones I've seen could stand up to a dozer for long. Eric ...where did you come up with the 16,000 weight on the backhoe? It's possible, I just thought that pound for pound the dozeer would be heavier and it's weight I could reference. Haven't been able to reference the weight on the backhoe. Gary ... I've had guys tell me that I could run "Farm Plates" on my dually and get past having to have the CDL if I want to run the tandem duals. But I didn't find that exclusion in the CDL handbook. (I picked one up in case I decided to study for it.) Are you aware of any other way to avoid the need for a CDL or will the combined GVWR get me when I step up to the tandem duals? I went down to the Troup G State patrol office to have a visit with some of the State Patrol guys on the subject and see if I could get some clarification. If you can believe it, none of them could tell me what was or wasn't the case on the rules. I told them I figured they were the best source since it would likely be someone from their office that would pull me over to check me out and ticket me if I wasn't legal. Nope ... they had no clue. Told me I needed to go to the DOT next door. Ok ...went there, it was like talking to a wall. They just wanted to hand me the CDL study guide and move on to the next person in line. Gary, when you say that "anything over the max weight that my trailer can scale must be transferred to the pickup to be legal" are you referencing the literal placement of the load being placed forward so that the weight transfers to the rear axle of my dually or also the licensing of my truck and it's corresponding licensed weight? I have owned a couple backhoes in that same class as the 410, and operated many of them. The similar sized JCB I have now is 17,000 or so. But I didn't ask you if it was enclosed cab, 4 wheel drive, extenda-hoe and a 4-in-1 loader. It will be a lot lighter without all those things. I honestly don't know about the CDL requirements either. I ran a pickup and 23,000 lb trailer with no CDL for many years and only once had a problem. And on that occasion the DOT first told me I had to have a CDL and medical certificate and then backed off on the CDL after he talked to his superiors for over an hour. But he gave me a citation for the medical certificate, just to save face I think, and I eventually got the medical certificate to avoid the fine. So the whole CDL thing for pickups is a crapshoot. And part of the reason for uncertainty is the farm exemption and the retirees with big fifth wheel campers. In the end, most DOT guys don't want to deal with it and just leave you alone. As far as the weights, all trailer manufacturers will rate their trailers with a portion of the weight being transfered to the hitch so as to inflate the rating and it's all legal. But when the DOT checks your weight, the first thing they look at is the tire ratings and the first rule is you can never exceed a tire rating. So if you have a 14,500 lb load on a 14,500 lb GVWR trailer with E rated tires, you must have the load far enough forward to put about 2500 lbs on the hitch and then hope you do not exceed the rear tire ratings on the pickup. But that's where a dually is good with E rated tires you have about 12,000 lbs of tire capacity on the pickup rear axle. That was a good thing to go to the DOT and ask your questions. So now you should just go with the tandem dual trailer and remember the date you went to the DOT and if you ever get stopped, remind them of that day. All this uncertainty is another reason for the higher rated trailer. You just do not want to go past the DOT with a trailer that looks small with a backhoe or dozer on it. That's just an invitation to being stopped. Always make it look like you have adequate capacity including tie downs and they will usually leave you alone. And that includes all lights working and not speeding. But that rule has become a way of life on the highways these days as the government is short of money. Never give them an excuse to look at you twice. The laws are changing in most states to comply with US DOT regulations, because the Feds have decided to deny transportation funding to non-compliant states. Now, in Pennsylvania, a "farm tag" can only be used if no trailer is being hauled. It doesn't matter the weight of the vehicle, if your towing, no farm tag. Fines are stiff. All the livestock haulers in our area have gotten their CDL and US DOT number. Like you, we got a different answer from law enforcement for each individual that we asked. Finally, we got answers when we drove to the Weigh Station and asked the guy that does the inspections. Looks just like mine in my gallery. The weight is all the way at the bottom of the pdf. Landon, much good information has been shared thus far, especially by Gary. I'm pretty much doing what you're asking about, and here is what I know about it. To determine how much you can put on the trailer, take the lesser of the total axle capacity or the tire capacity. For discussion sake lets say that your trailer has 7K axle's and tires rated at 3,600 lbs. The lesser figure would be 7K per axle, or 14K combined. Now, subtract the empty weight of the trailer from the gross capacity, in order to arrive at net capacity. If you're trailer weighs 4K lbs empty, this number is 10K. Next, determine the max trailer tongue weight (5th wheel) published in your owners manual for your pickup. For discussion sake let's say that this number is 5K lbs. Add this number to the 10K net capacity number and your theoretical max trailer payload would be 15K lbs. 4. I have adequate weight on my truck license plates (My F450 is licensed for 45K lbs gross, which includes the trailer and payload). For what you want to do, I'd suggest either a tri-axle trailer or a dual tandem trailer (my first choice), either one in gooseneck design. I would also recommend that you upsize the brakes on the trailer with hydraulic disc with the electric master cylinder; these are about the best brakes available for medium duty trailers. Also, get the best tires that you can. Stay away from Carlyle and Chineese tires too; my experience is that they will not hold up under the loading. My heavy gooseneck is a 37' deck, dual tandem (12K axle's) with a hydraulic dovetail, rated at 26K lbs gross. It has the electric over hydraulic brakes that I recommend above, and I routinely use it to move a Cat 420Dit backhoe (16K lbs), or a John Deere 550C Dozer. I noticed a significant difference in towing and braking capacity when I upgraded from an F350 to an F450. It is not overloaded, the bumper is not on the ground.
. I've got a Forf F350 Crew Cab 4x4 dually with a GVWR of about 10K I guess. That means any trailer I add to it needs to have a rating of less than 15,999 lbs to keep me under the 26K that would require me to get a CDL. Thanks for all the comments guys. Scott, a lot of what you said echoed what I was told by a guy here who sells goosenecks. He's straight up. I do a fair amount of business with him on other things. I told him last trip in that the only reason I hadn't bought a gooseneck was because I was having trouble getting a straight answer on the GVWR and CDL issue. Truth be told, I've got an itch in me to buy a full size tractor trailer. I don't ever see me being the type that doesn't have something going on and something that needs moving. I called Landstar Inway to get a freight quote on hauling these two machines up here from South LA. They wanted over $5.00 a mile. They're so busy hauling oil/gas equipment that they're getting the money all day long. I think the last load they hauled for me was like $2.25 a mile. ....And where'd that grader come from Scott? Man I can't keep up with you! I like the tractor trailor idea. There some good deals out there too. Just tougher to overload. If your buying new dont overlook 17.5 supersingles instead of dual tandems. They are equally rated and its 4 less tires to buy/ patch/ fix. Sorry for the confusion LD, I had a more modern machine in mind set up like I have ran. My mistake. Before I knew any better.....I got ticket for operating out of class for not having a class A CDL and an overwight ticket for not having my truck liscensed for the combination of truck and trailer weight. All i was doing was moving an empty tandem duelly trailer with my pickup down the highway. Now I have my truck liscensed for 12 tons and have my CDL. Would have been a lot cheaper to do that up front . Landon, from a hauling perspective, you can't beat the capacity of a full size tractor trailer. The toughest choice will be figuring out what type of trailer will be the most versatile for you. You might want to check out Landoll trailers. They make a low-boy hydraulic tilt trailer where the axle's move forward to lower the back end of the trailer to the ground. That would allow you to load and move most equipment (unless you needed a true low-boy), as well as logs and other materials. The laws have surely changed but about 20 yrs ago my brother and I had a business selling and installing outdoor furnaces. At one point we started hauling a 6 ton tilt bed trailer with a tractor/backhoe on to dig the trench. Before we did we stopped at the troopers and asked to "be sure we were ok" We at the time both had our chauffeurs licenses (before CDL's) and we were told we were OK. We had a 450 flatbed we loaded the furnace on and the trailer carried the TLB, all within the tagged MGVW's of each. The first time we had to pull over at a weigh station, my brother was driving and he got a ticket for the total weight not being allowed for the truck trailer combo. I don't remember the specifics but I remember the ticket after the troopers said the exact combination was legal and the inspectors didn't care what the troopers had said. We ended up having to get a 26,000 GVW flat bed and a 18,000 GVW goose neck trailer to be legal. Then CDL started coming about (1994 maybe) and we decided to stop hauling the TLB and have the customer hire a local to do the trench. We then just got a roll back to haul the furnaces and no more problems witrh incorrect trooper info. Basic lesson, find someone from DOT, preferably US who will give a straight answer. I now have my CDL and it is not that bad to get, you might be better getting it. Sounds like you need a dump truck with a tilt bed. "If your lucky enough to be a logger your lucky enough!" Scott you're right about the Landoll trailers. They're really slick. I have most of my machines brought in on one. I had to use a drop neck lowboy to bring in the Pettibone because of it's height. Otherwise that Landoll is slick, those axles just slide forward and the tail drops down. We high centered that lowboy that came in here. There's a subdivision on my east line that we have to come through and he got hung up trying to make a tight corner. Never have that trouble with the Landoll. The idea of the dump truck with a tilt bed ... I could definitely use a dump truck. In fact I have my eye on one. The thing is, If you have to go any distance, that combination isn't going to give you much of a ride. Lots of guys running that combo around here though for sure. Page created in 0.918 seconds with 35 queries.